The first thing you should know is if you run afoul (pun very much intended) of the law, I can’t bail you out. If you read the “About the Author” page on MentalMunition.com, you’ll note that I’m not a lawyer. My only legal qualifications are an undergraduate course in media law. Having said that, I started researching drone law and writing back in March, shortly before the Brookings Institution organized a panel on domestic drones and privacy. The ACLU had just published a report in December 2011 called “Protecting Privacy from Aerial Surveillance: Recommendations for Government Use of Drone Aircraft” that referenced important Supreme Court cases that might play a role in drone law. Just this week, Alexis Madrigal, the senior editor for the Technology channel at the Atlantic, wrote about two cases that could have some bearing on drone law, Guille v. Swan, and U.S. v. Causby. The latter involved dead chickens. I’ll be writing about that case here. When we talk about drone laws, we’re talking about a speculative thing. To date, no journalist has been sued for violating rights of privacy with an unmanned aerial system. There is no legal precedent specifically for drones as of yet, although that might change in the near future. As drone technology proliferates, so too does the potential for abuse and for court cases. But the United States courts are not absent of precedent that would come up in a privacy case involving drones. It’s is important to keep in mind that in many cases drone journalism is a form of aerial photography, albeit an unmanned form of aerial photography. Additionally, cases that consider whether the National Airspace System (NAS) is public or private are highly relevant. First, do people have a right at all to fly drones above private property? In U.S. v Causby in1946, the Supreme Court ruled that a land owner does not own the rights above the land (i.e., “air rights”). SCOTUS ruled that the common law doctrine of Cujus est solum ejus est solum ejus est usque and coelum, or “whoever owns the soil, it is theirs all the way up to heaven,” was obsolete. The lawsuit resulted from a North Carolina farmer who owned a plot of land near a military air base that serviced heavy bombers. The glide path for landing these bombers at the airport meant the four-engine aircraft would buzz the property, just 67 feet above the house. The farmer had used his property as a commercial chicken farm until 150 of his chickens reportedly died from fright, with as many as six a day flying into walls of the chicken coop and killing themselves in the process. Production at the farm dropped, as did the value of the farm itself. The family living on the farm also said they were frightened that a bomber would crash on their property. What’s important to come out of this case is that SCOTUS recognized that a certain portion of the airspace was in the public domain. It wrote that the Air Commerce Act of 1926 had made the country’s airspace a public highway (the ACA actually placed the authority to regulate the airspace under the Secretary of Commerce). However, the court also established that the line where the public airspace ended and private land rights began. That line was the minimum safe altitude established by the nation’s air authority. That height was, and continues to be, 500 feet above ground level (AGL) over populated areas, regardless of the glide path into any airport. While SCOTUS ruled that Causby didn’t have air rights above his land, the court said the farmer was entitled to compensation from the government. This was ultimately for two reasons: the bombers flew under the minimum safe altitude (ostensibly into private property), and this encroachment impaired the viability of his land. How could this translate into drone law? For one, the NAS (again, the air 500 feet and above ground) is a public space. While civilian drone use is heavily restricted in the NAS at this time, with the FAA promising to loosen those restrictions by 2015, the air above your property is a public place where drones can roam free. It’s interesting to note, however, that many drones may not operate in this space. The drones I operate, for example, are only allowed to fly under 400 feet according to air law. That’s the altitude limit that all drone hobbyists and enthusiasts today must abide by. And the majority of sUAS, or small unmanned aerial systems, the ones the FAA is expecting to proliferate rapidly, will probably spend a great deal of time at altitudes below 500 feet. Drone journalists might prefer flying at lower altitudes, which allows for greater spatial resolution and potentially better photos. The air above 500 feet is public property, but will 400 feet above your property be considered private? What about 40 feet? We don't know the answer to that question yet, because it appears that nobody has been taken to court over the issue. At least twice hunters have shot down drones from an activist group trying to record pigeon shootings. And at least one of those drones have fallen onto private property, with the activist group threatening legal action to retrieve the drone, but I'm still investigating to see where that case has gone. Perhaps some other standard, tangentially related to altitude, will determine if a drone is encroaching on private property. After all, the court ruled that it was antiquated to believe that owning the soil meant you also owned the heavens, so something might convince the courts that the current limit of national airspace is antiquated as well. Top photo is from the Flikr account of anyjazz65, and is one of about 370 film negatives of activities at a British airfield in 1944 that he found. 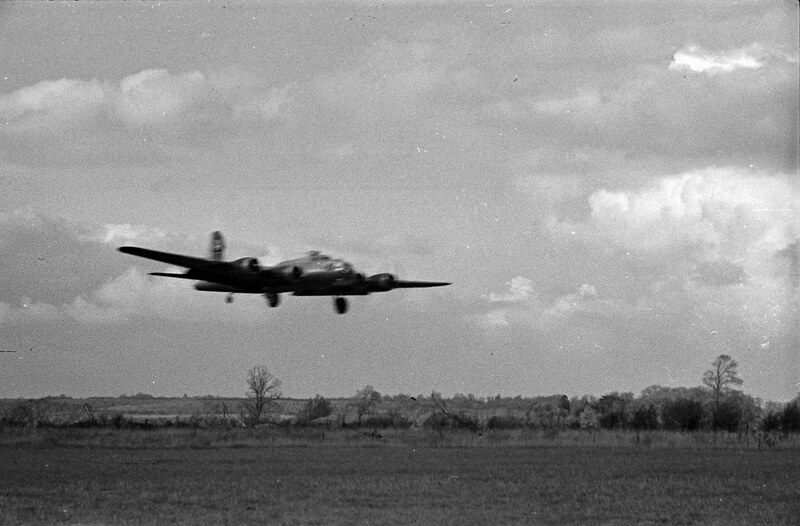 This photo is of a B-17 bomber, likely the very kind of aircraft that was central to Causby's dispute.